Stories and history from America's premiere coast-to-coast highway. The ninth annual Lincoln Highway Buy-Way Yard Sale will be held August 8-10, 2013. The sale, started in Ohio in 2005, has expanded westward but the Ohio Lincoln Highway Historic Byway still leads the efforts; last year saw more than 1,200 sales from East Liverpool to the Indiana border according to Mike Hocker, executive director of Ohio’s byway. The Ohio Historic Byway publishes a Travelers Guide that includes a map showing the Lincoln’s route and its relationship to US 30. 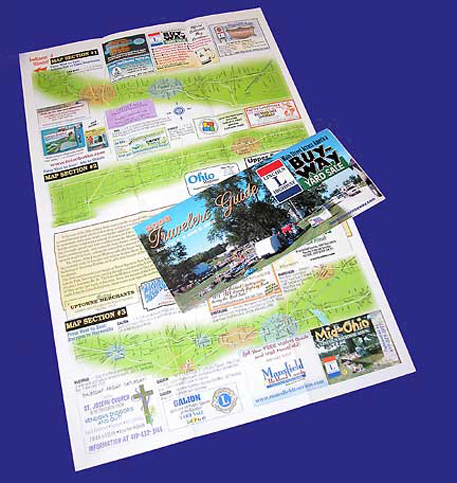 The guide can be found at many businesses along the corridor. Indiana, Illinois, and Iowa will also have sales along the route. In fact, Council Bluffs in western Iowa will host its own Lincoln Highway Buy-Way Yard Sale on Saturday, August 10, at 2400 N. Broadway (site of the former Pee-Wee Gardens on the LH) from 9 am to 2 pm. It will feature antique cars, model airplane demonstrations, and Lincoln Highway Association members discussing the highway’s history. The 8th Annual Buy-Way Yard Sale along the Lincoln Highway starts this Thursday and runs through Saturday, Aug. 11. Started in Ohio, it has grown to include West Virginia and parts of Indiana, Illinois, and Iowa’s Lincoln Highway communities. “If you are looking for it, it’s out there somewhere waiting for you to buy at a bargain price,” says Mike Hocker, executive director for Ohio’s Lincoln Highway Historic Byway. “This three-day BUY-WAY Yard Sale has not only introduced people from all over the country to the history of America’s first coast-to-coast paved roads, but it also provides an economic boost to the communities that participate, and it serves the thrifty side of all of us who find that bargain.” Visit www.historicbyway.com for more info. Lincoln Highway Buy-Way coming your way! It’s once again time for the annual Lincoln Highway Buy-Way Yard Sale running August 4, 5 and 6, 2011. The miles-long event began in Ohio seven years ago and has since expanded to all of Iowa and parts of Illinois and Indiana. Ohio publishes an official Traveler’s Guide that includes a map of the state’s Lincoln Highway alignments plus listings of many yard sales and community events along the way. This free guide is available at convention and visitor bureaus and chambers along the route. BUY-WAY Yard Sale participants in any state may list their yard sale information on the byway website www.historicbyway.com that shoppers can print out and use to navigate their shopping. For more information on the Buy-Way, call (419) 468-6773 or visit www.olhhc.org/index.php/buy-way-yard-sale/. 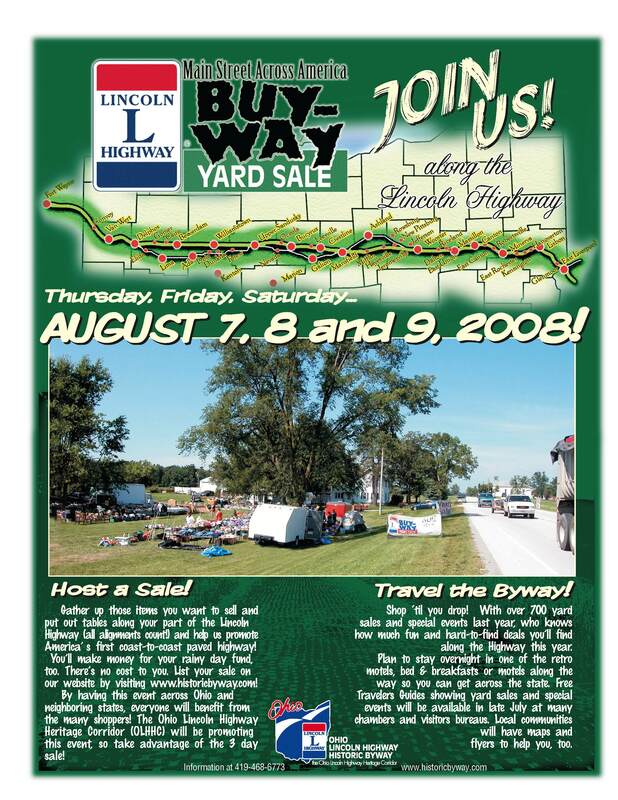 The fifth annual Lincoln Highway Buy-Way, a yard sale that stretches across five states, will be held Thursday–Saturday August 5–7, 2010. The event was launched in Ohio, then expanded to include West Virginia to the east and Indiana and Illinois to the west. This year the sale has grown to include Iowa. “This event has grown to national awareness in just five years,” said Mike Hocker, executive director of Ohio’s byway group, whose mission is economic development. A free Traveler’s Guide includes a map of Ohio’s Lincoln Highway alignments along with listings of many yard sales and community events along the way. Learn about Ohio here or get other state links on the LHA site. Hit the road today through Sunday, August 6 – 8, for the fifth annual Lincoln Highway BUY-WAY Yard Sale. Sales will stretch from Chester, West Virginia, across the Ohio River through Ohio and into Indiana and Illinois. Look for tables and tents along the way. Many businesses in Ohio will have free maps available like the one seen here. Mike Hocker, Executive Director of the Ohio Lincoln Highway Historic Byway, reports that while delivering Lincoln Highway travelers guides, he met Mike Van Doren and his wife Dawn, new owners of the old Dutch Mill east of Van Wert, Ohio. The couple did not at first realize the building’s historical significance but it, and the coast-to-coast road it’s on, now has them excited. The place was a “one-stop” for gas, food, and lodging in the 1920s, and a short section of original road remains on property from when the curve outr front was straightened. The roof is leaking and needs about $25,000 to repair but the “bar” is still in there, and that’s one of the reasons they bought it. They will be having the BUY-WAY yard sale activities there (August 6-8). It surely is great to see someone wanting to preserve this stuff. The Old Dutch Mill is at the junction of Middlepoint Road and old Lincoln Highway just east of Van Wert. There were some 700 vendors last year and without an official count, there were at least that many this year, plus, he says the past three years were hot and humid and last year tornadoes threatened. West Virginia’s town of Chester, where the Lincoln Highway passes through, had a strongly organized sidewalk sales and adorned their streets with BUY-WAY signs. It is always fun to see a new community come on board! 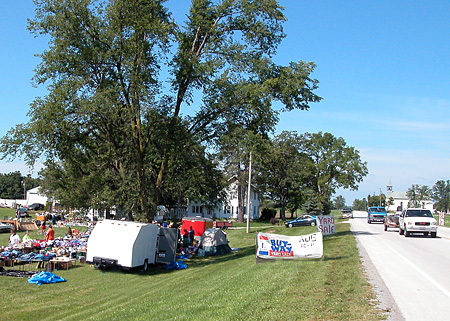 Van Wert was the poster child this year by having invited the Route 127 (World’s longest) yard sale to extend northward and cross the Lincoln Highway in that town. That community was a buzz of activity from the fairgrounds with a huge flea market and other festival-type activities, to the north-south corridor of Washington Street (Route 127) and then across the Lincoln both east and west with many, many yard sales. New multiple dealers have found their spot this year, too, setting up shop in highly visible places along the way and offering just about anything a person could need. One dealer reported 95 cars per hour, then got too busy to count. Multiply that traffic across the state and we are accomplishing out mission of bringing dollars to the Lincoln Highway corridor and exposing people to the history of the road! Also, a few more communities produced and distributed community yard sale maps in addition to our Travelers Guide, helping people to understand the rest of the story; in fact Forest, Ada and Bucyurs went to “community-wide” sales this year, not just the LH corridor. The Delpho Herald reported sales were brisk: “It wasn’t just local people who were traveling the highways, as Lee said he had spoken to shoppers from at least 12 other states as far away as Florida, Alabama, New Jersey and Wisconsin. There were shoppers from Canada, and Lee said he had spoken to a local retailer who had a customer from China.” Also read about Van Wert here. Indiana and Illinois also participated and we hope to get reports from those states too. Next year’s dates will continue to be the second weekend of August: August 6, 7 and 8, 2009. A free Lincoln Highway BUY-WAY Yard Sale Travelers Guide is being distributed along the different routings of the Lincoln Highway through Ohio. The fourth annual BUY-WAY Yard Sale will take place August 7, 8 and 9. The guide features a map of all Lincoln Highway alignments and towns in Ohio, plus contains listings and ads for more than 50 of the larger group events. Guides can be found at participating businesses such as restaurants, attractions, and convenience stores. In the 1920s, much of the old route in Ohio was marked US 30 but modern 4-lane improvements bypass the old towns and alignments. That means Ohio alone has roughly 350 miles of yard sales, community events, and festivals with lots of food, drink, and fun for kids. Last year saw more than 700 individual and organizational sales just in Ohio. Indiana and Illinois are participating too, and West Virginia’s 2.25-mile segment of the highway through Chester is also part of the BUY-WAY sale. More information and a printable listing of yard sales and locations can be found at http://www.historicbyway.com (updated frequently). To get your guide ahead of time by mail (free for the price of a SASE), visit the travel guide page. The Lincoln Highway Historic Byway created this event four years ago (in 2005) on the outside chance that it would ‘go’ and we’ve been busy managing it ever since,” said Sara Lou Brown, Wyandot County’s Visitor Bureau director and president of the state-designated byway group. The first year saw over 250 yard sales across the Ohio portion of the Lincoln Highway, America’s first coast-to-coast paved road. As the original road was improved from 1913 to 1928, it took several parallel alignments in a few areas, which may confuse “non-history-savvy” shoppers, but thanks to many organizations wanting to bring traffic to their door, a new traveler’s guide and map will be printed showing not only the road map of the highway, but also a listing of many yard sales and community events along the way. This free guide will be available in mid July. Mike Hocker, executive director of the byway noted that “we think we are going to have over 700 yard sales in Ohio, parts of Indiana, and even Illinois this year…but the best news is that yard salers, of which we have virtually no control, seem to be organizing into larger and (cooler) venues for the hot August fun. This makes for safer traffic and parking, provides for restrooms and other creature comforts, and makes for longer browsing of more “stuff.” Communities are also adding festival-type activities such as concerts, car shows and rallies, food and kids’ activities…all to make the event more enjoyable for those travelling. Yard Sale participants may also upload their yard sale information onto the byway website, (www.historicbyway.com) which shoppers can then print out and take with them to follow as they shop. For more information and official yard sale supplies or details about listing in the travelers guide, call (419) 468-6773. All text and images © 2007-2018 by Brian Butko. Feel free to share just please give credit. Click the map above for a full-size view of the Lincoln Highway. Like this blog? You'll LOVE my books! Lincoln Highway Companion features detailed maps and places to eat and stay. Click the book to buy it on Amazon. Click the Greetings book below to purchase the ultimate guide to the history and route of the Lincoln Highway! Another fun book! The Ship Hotel: A Grand View along the Lincoln Highway recalls the greatest roadside attraction along the coast-to-coast road. And for those who LOVE diners, click the book below to purchase our completely updated guide to the history, geography, and food of Pennsylvania's Diners!